Eldest Tot Tester has been sent a selection of Monsoons party wear in time for Christmas. Monsoon is a high end High Street brand, linked with Accessorize stores, and sells clothes for both Mum's and kids. I've often passed the window display in my local store and wished I could dress my daughter in some of the dresses they display- but know that she will destroy them within five minutes at playgroup! The attention to detail in the items we were sent is excellent, with fully lined dresses in beautiful colours and fabrics. 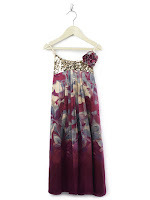 My favourite of the selection was a purple polka dot chiffon dress, with a sequin detail to the neck. The dress would look lovely on any little girl especially for a party, or a wedding. Monsoon and their designers do not scrimp on detail just because the dresses are smaller, with embroidery, tiny silver buttons and corsages as well as the best fabrics available- no standard cotton or polyester here! The dresses have hidden zips and lovely ribbon tie details too. The range also includes comfy yet girly Gilets in fur and velvet, and woolen and silk shrugs. It means that a parent can invest in one dress and then a few matching accessories for a capsule wardrobe effect. 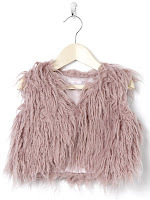 Chrissy loved the purple Furry gilet we were sent, and I feel this could be worn as a way of keeping shoulders warm over a party dress without having to wear a big coat and spoiling a look, or with a long sleeved top and jeans to funk up an everyday outfit. The style of dress is classic, rather than being miniature adult clothes that some High Street chains are guilty of churning out, the dresses are the sort one could expect to see Suri Cruise wearing! The sizes are generous- whereas Tot can wear anything between an age 2 and a age 5 in other High Street stores, in Monsoon, age 2-3 means just that. The quality does come at a price, with shoes upwards of £20, and dresses and tops between £25 and £60. Shrugs are a more reasonable £20. However, these are not just for wearing to get muddy in the garden-if you are going to a party over Christmas, or have a christening or other special occasion to attend, then a one off amount to have a dress for any occasion in the wardrobe is worth the expense.